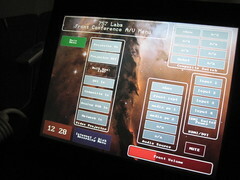 Some minor updates are active on the AMX system at the lab. First, the front screen now has the video projector bulb hour counter displayed on it. It polls the projector every 15 minutes for this. This is the first time I've ever read external data into the AMX system. There is also a "suspend lab" button on the home screen. It will shut off all downstairs lighting, the arcade games, the projector, and set the volumes to 0.